Android Oreo 8.0 based LineageOS 15 for Nexus 5 is now available to download via an EXPERIMENTAL development build. 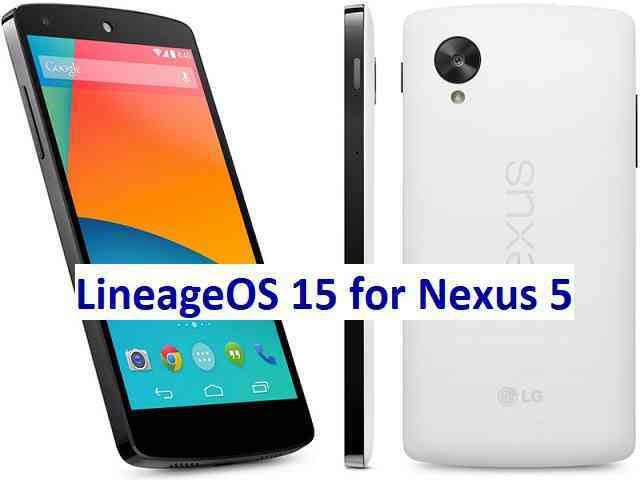 This post provides the download link to the Android Oreo based LineageOS 15 for Nexus 5 and guides through the installation process of the same. This Lineage OS 15 for Nexus 5 is brought to you by developer tathanhlam66. If you want the OFFICIAL Lineage OS 15 update or some more Android Oreo ROMs then stay tuned to the Lineage OS 15 ROMs page or the AOSP Oreo ROMs devices list page. Reboot and Enjoy Android Oreo with LineageOS 15 for Nexus 5. Stay tuned or Subscribe to the Nexus 5 (hammerhead) forum For other Android Oreo, Nougat ROMs, LineageOS 15 ROMs, other custom ROMs and all other device specific topics. it’s fast like hell and battery drain seems to be better too. I came from Lineage OS 14.1 official. I’ve rooted with the latest Super-SU for Oreo. No problems but one thing: adb over usb does not work. Hi, thanks for the good work. Installed the ROM and it is running smooth ! New features are very welcome. One issue is that my bluetooth phonecalls in car are distorted, while streaming is ok. The 15.1 download is offline!? Is there nothing newer than 3 months old? Well, I have added back appropriate links to Krizthian’s LineageOS 15.1 for Nexus 5. It is highly appreciated if you can donate to Krizthian for his builds. He is in need of donations to run his build server.